August 3, 2016 December 1, 2010 by Vinay Leo R.
Written for Thursday Poets Rally, Week 34, December 2nd to December 8th. 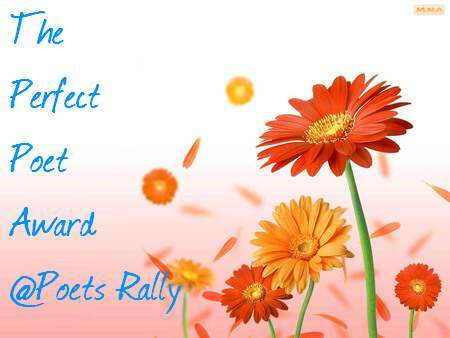 I’ve been nominated for the Perfect Poet Award for the previous Rally Week. I accept it with this poem above, and in accordance with the criteria, I nominate Purvi for the next week’s award. yeah, it is sort of eternal, Tweety.. and its a question that we all face a lot of times in life.. glad u felt it was a lovely portrayal.. I loved reading that Leo–you made me think. Thanks. I love the way you structured your poem…. not alot of people care about structure these days but I do.. I love to be different… I love all different ways to present one’s work.. and this right here is very good.. I dont give a lot of thought to structure, Mase 🙂 but it comes out well at times.. glad u liked it.. The poem is really nice and thought provoking. thanks 🙂 yeah it is kind of tall, isn’t it Wordsworth Millions? 🙂 glad u liked the structure…! Glad to see the flower blossom. Thanks for the acceptance and nomination..
What matters? She would matter for a while, to give some happiness to humans, but that’s all she can do. She wish to live longer and linger in the eyes as a beautiful creation but that’s not what she’s created for. What matters? We are sometimes like flowers, a beauty for a fleeting moment but will surely have an end….WILT!!! A very beautiful concoction of verses… As lovely as a flower… perfect!!! thank u, Emmanuel 🙂 glad u liked it. Cheers..! This is lovely, Leo. What a dilemma for that flower. well yes.. she could, but won’t her love for what others want of her, and also that joy, be short lived, Bodhi? she might end up blaming the others for losing her beauty.. Her joy could be a lifelong joy for her–which by the way, is not very long–flowers simply don’t have a long life span whether they’re left attached to the plant or cut. Or she could turn bitter and hold a lifelong grudge (which again, won’t be very long). hehehe.. I wasn’t speaking literally, Bodhi. the flower is a metaphor, and it is some person’s dilemma. to do something they are loving, and having fun doing.. or to listen to someone else who feels that they’ve a better chance of a stable life doing something they’re interested in, but not very much in love with like the first one. deciding between their love for their freedom, and then an option given by someone they trust.. thats the dilemma I’ve tried to portray..
hmm. thats a good point.. now the flower will be even more confused.. Loved your haiku! Definitely spoke to me. You’ve talked about a very philosophical debate, and I really love the way you’ve presented it. I still often ponder over these lines and wonder which is better, momentary joy or a long and safe life. I don’t think there is any correct answer to it though, it all depends on perception. Wonderful poem! Life and its questions !! You are a wise poet Leo 🙂 Liked this !! I liked the way you brought out the dilemma of such choices, in your poem here… sometimes, it seems all too easy for an outsider, but the guy facing it cannot really say the same… Lovely poem, my friend! Kudos on the neat visual as well! yeah, you got it spot on Kavi 🙂 indeed such momentary bliss can be wasteful. glad u liked the poem, and yes, there is no way the one on the outside can understand or perceive how the person in the situation is feeling. thanks Dancingfreak 🙂 glad you liked it..! What matters?…” For it has no control over its life. Very thoughtful and well done!! Every line is like 3-4 words….and the entire poem is cool too!!….Cheers!! The coolness of your poem just emerges with every line. You are like the Fonzie of Poets! lol. not that cool for sure, Tasi 😀 glad u liked the poem. thanks Doc 😀 glad u liked it. Wow! It’s such a heavy decision with similar price. What matters indeed. yes, only if, Liliana 🙂 glad u liked the poem and found it to be a beauty..
Nice poem. It made me think about the things we do to make others happy. beautiful, one word to descirbe this master class work..
We all have to ponder what really matters. Great way you expressed it here. Thanks for commenting on my piece. Happy Rally! pingback from Thursday Rally Poetry… “Festive Poetry”. Thanks for your comments on http://shawnbird.com/2010/12/03/night-warmth/ I appreciate it!